This is a guest post by Larry Elder. 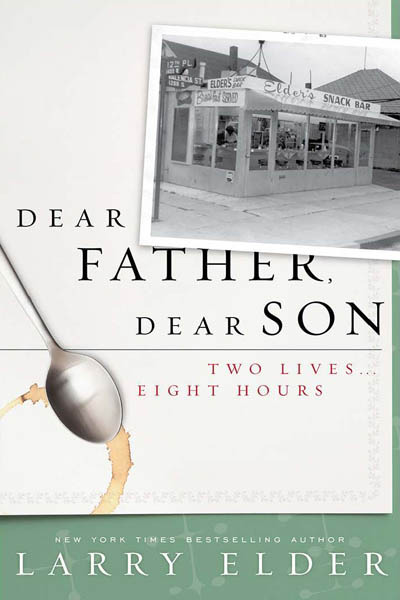 He is author of Dear Father, Dear Son now available for order on www.larryelder.com. If you would like to blog for us, email here. Heard of Tiger Moms? I had a Junkyard Dawg Dad. “Dear Father, Dear Son,” my new book, is a 247-page apology to this very special, WWII retired Marine, my father. I knew virtually nothing of his life, and never had a conversation with him, until I was 25. From the time I was fifteen -- when my father and I had a big, long-time-coming fight -- until ten years later, we did not speak to each other. I wanted nothing to do with this volatile person who, for reasons that escaped me, managed to marry my mother. Our little home, where my two brothers and I slept in the same bedroom, instantly became a place of tension the moment Dad set foot in the front door. Was it supposed to be like this? After ten years I sat down and talked to the man -- for eight hours. Why, I wanted to know, were you so damn angry all the time? Why did you whip the three of us -- my two brothers and me -- so furiously? Did you know that the three of us were scared to death of you? Did know that this fear crossed into hatred? Did you care? Does this even matter to you? An only child, my father was a black boy born to an illiterate single mom in a rented room in Athens, Georgia. He was a child on the eve of the Great Depression in the Jim Crow South. He did not know his birth date, and used the one arbitrarily written down by a teacher when he started school. He never met his biological father. His mom raised him with a series of boyfriends, one of whom was a man named Elder. That man never married my dad’s mother. Worse, he was an alcoholic who beat both my dad and his mom. One day my dad came home from school and made too much noise for his mother and her then-boyfriend. They all quarreled, his mom siding with the boyfriend. My dad was thrown out of his house at age 13 -- never to return. A year later the Great Depression began. He dropped out of school and looked for work wherever he could find it. After a series of jobs as a yard boy, shoeshine boy, hotel valet and cook, he finally landed a prestigious job as a Pullman porter, then the largest private employer of blacks in the country. It was as a Pullman porter that Dad first visited California. He thought of it as a less prejudiced place, loved the climate, and made a promise to someday return. After Pearl Harbor, he joined the Marines. Why the Marines, I asked? “I liked the uniforms,” he told me, “and they seemed to always go where the action was.” So they made him a cook. He trained at Montford Point, the segregated Marine base next to Camp Lejeune in North Carolina. He was soon put in charge of food services, and became a staff sergeant, stationed on Guam in the south Pacific. But when discharged, he could not find work as a cook despite his now-considerable experience. He went to an unemployment office in Chattanooga, Tennessee where he was instructed by a white clerk to walk through the “proper door.” So he goes out into the hall, goes through the “colored only” door to the very same clerk who told him to go through the "proper door.” “Now, how may I help you?” she said. There has to be better place than here, he thought. Dad left for California. He worked two full-time jobs as a janitor, and attended night school to get a G.E.D. He averaged less than four-and-a-half hours of sleep for years. Pressure, lack of sleep, “running from job to class,” he told me, makes a man a little grumpy and impatient -- especially when raising three loud boys with a stay-at-home wife. He worked so hard, he said, because he never had a father, a secure home and “food in the icebox” to come home to after school. “So,” he said, “I did my best to give you kids what I never had.” He told me that growing up without “a real father in the house” was not a death sentence. If you work hard, and people “see you struggling,” they will help. But it’s up to you to play the cards you are dealt the best way you can. And the best way is through hard work. They care, Dad. For those born and raised in tough circumstances, you show the path: While we cannot control our circumstances, we are in complete control of our effort. What would you tell your dad if you could sit down with him like Larry did his father?